There is an old joke that says, “I’m not afraid of heights – it’s the sudden stop that bothers me.” While the joke is clichéd and more than a little silly, it captures the essence of working at heights. The definition of working from heights seems like it should be pretty well universally understood, but what constitutes “working” and what constitutes “at height”? Unless we truly understand the answers to those two questions, keeping ourselves safe while working at high becomes troublesome. Let’s begin with “working” – work is any action we are taking while in the workplace1. For the purposes of this article “working at heights” will include everything from working on a lengthy construction project at the top of a tall tower or taking a shortcut by walking across a catwalk. Height, on the other hand, is a relative term, but for our purposes, height is an elevation at which there is a better than average chance that a person will be harmed if he or she were to fall from it. There are plenty of variables that effect the dangers of working at height – everything from the traction on the surface on which a worker is standing to what the worker is standing above (falling in a six foot pool of water is less hazard than falling on a marble floor, for example) which leads to many workers irresponsibly failing to take proper precautions. Protecting workers from injury resultant from work at heights is one of the most difficult challenges in safety. There are relatively few controls we have at our disposal and one of them is rarely feasible. The first and most effective safety measure is to eliminate the need for workers to work at height, and while this is sometimes possible, these situations are extremely rare – people seldom work at height because they want to, they do it because it is the only way to get the job done. The most practical way to protect workers is fall protection PPE which can involve several considerations that many people fail to recognise. It is counter intuitive, but the majority of accidental fatalities from falls from heights occur from relatively low heights. In fact, 40% of all fatal falls occur at a height of three metres or less and are the result of a fall from ladders, so while common sense may hold that the higher the work surface the more necessary the fall protection, this is not necessarily the case. For example, if a person should faint while working at height (from heat exhaustion, dehydration, or any number of common conditions that can befall a worker), during a dead faint a person may shift from standing to striking his or her head during a fall greater than two meters; other factors like the momentum caused by a slip can reduce the height at which a person’s body will rotate its position. Fall protection should be considered whenever there is an increased risk of injury – regardless of the height at which work is performed. Clear the area below your work site – Many fatalities and serious injuries are either caused or worsened by striking objects, equipment, or stock that needn’t have been in the area. As outlined in the following sections, fall protection falls into three categories: prevention, passive systems and active arrest systems. Preventive fall protection seeks to prevent workers from entering the proximity of the fall hazard through the use of guardrails, barriers, safety decking, visually marked “danger zones” and/or purlin trolleys. These preventive measures are often ineffective for jobs that are short in duration, where the workspace moves frequently, or in situations where the work must be done while suspended. Passive systems are those safety controls that protect workers after a fall has occurred and typically take the form of safety nets or fall arrest mats. Passive systems are particularly useful in motion picture production where the actors may work from heights but cannot wear active arrest systems. The motion picture industry isn’t the only industry that uses passive systems; passive systems are useful and effective in residential roofing operations. By far the most common form of fall protection is active arrest systems. Active arrest harnesses are specially designed to gradually slow your fall so that you don’t stop suddenly and suffer a severe injury. An uncontrolled fall (for instance tying a rope around your chest) is not effective in protecting you against injury or death, because as you fall your body is travelling at rapidly increasing speed3 (and while a rope or similar device will stop you from hitting the ground, your internal organs continue travelling at that speed and the sudden stop can cause lacerations of your organs, can break bones, and generally turn your insides into goo. Unfortunately, there are just too many variables to predict a precise height where a fall arrest system is necessary. This author knows of at least one company that requires fall protection anytime a worker’s duties required him or her to work at a height above two meters and then issued fall arrest harnesses with three meter lanyards, this meant that the harness offered absolutely no protection and may in fact have contributed to several falls and near misses. When used appropriately, however, fall arrest systems offer the best protection against injury or death. Fall arrest systems protect you from the sudden stop; while it is still possible to be injured while using a harness, the injury is likely to be less severe. Many people are killed or seriously injured even though they were wearing a harness. For example, a person in poor physical condition may be injured simply because his or her muscles, bones, or internal organs may have been weakened by disease or simply because the person isn’t physically fit; knowing your physical limitations is a key aspect of fall protection. Another important aspect to the effectiveness of fall protection is the physical condition of the system itself. Like any other piece of equipment harnesses, fasteners, lanyards and other components of a fall arrest systems wear out over time and with or without use. It is imperative that you closely inspect your harness before putting it on and alert your supervisor of any wear or damage. Even seemingly insignificant damage or wear can cause a system failure in the event of a fall. Similarly, fall arrest systems are not a “one-size-fits-all” product. Your fall arrest system should be fitted to your body and you should never borrow someone else’s PPE as it may not provide sufficient protection for you and you may find yourself slipping out of a harness that is too large or injuring yourself because of a harness that is too tight. Along those lines, if you have been hitting the scones a bit hard lately, you might want to be refitted to your harness to ensure weight gain or loss is accounted for – a properly fitted fall arrest can be the difference between life and death. While slamming into a hard surface after a very long fall is most certainly a hazard and most likely deadly, even “tying off ” incorrectly can cause you harm and even death. It is said that a chain is only as strong as its weakest link and this is true of fall protection, and in many cases the best intentions are foiled because of a lack of proper tie-off. Tying off involves affixing the lanyard to something that will hold your weight plus the force of a falling object. If you affix your lanyard to an unstable or weak surface you risk falling and having the materials you have tied off to falling on top of you. According to ANSI Z359.2 “Minimum Requirements for a Comprehensive Managed Fall Protection Program,” anchorages selected for fall arrest systems should have a strength capable of sustaining the static loads applied in the directions permitted by the system of at least: 5,000 Pounds (22.2kN) for anchorages not certified by structural or mechanical engineers, or two times the maximum arresting force for certified anchorages. Additional strength requirements for anchor points based on local legal requirements may apply. Following a fall, a worker may remain suspended in a harness. The sustained immobility may eventually cause the person to become unconsciousness. Depending on the length of time the suspended worker is unconscious/ immobile and the level of venous pooling, the resulting orthostatic intolerance may lead to death. While not common, such fatalities often are referred to as harness induced pathology or suspension trauma. Unconscious/immobile workers suspended in their harness will not be able to move their legs and will not fall into a horizontal position, as they would if they fainted while standing. During the static upright position, venous pooling is likely to occur and cause orthostatic intolerance, especially if the suspended worker is left in place for some time. Venous pooling and orthostatic intolerance can be exacerbated by other circumstances related to the fall. For example, shock or the experience of the event that caused the fall, other injuries, the fit/positioning of the harness, the environmental conditions, and the worker's psychological state all may increase the onset and severity of the pooling and orthostatic intolerance4. Unless the worker is rescued promptly using established safe procedures, venous pooling and orthostatic intolerance could result in serious or fatal injury, as the brain, kidneys, and other organs are deprived of oxygen. Falls are clearly the most common cause of injury to individuals who are working at height, but they are not the only hazard. Whenever you tie off you should ask yourself “if I fall is there anything between my body and the ground that I might strike before the harness stops my fall?” There are too many workers who are injured because they struck something before they strike the ground. Even in cases where there is nothing between you and the ground you may still suffer a suspension trauma because once your fall has been suspended your body could swing into an object. Experts estimate that as many as 240,000 people world-wide are struck by lightning and as many as 24,000 of those are killed. In fact, many safety professionals believe that the danger of injury from lightning strikes is grossly underestimated by those who work at height. According to Science Alert, the longest lightning strike on record was a 2007 bolt in Oklahoma that stretched 321 km (200 miles)7. Effectively this means that if you can see lightning you can be struck by it. The best defense against injuries from lighting strikes is to stop work and take cover when lightning is detected. 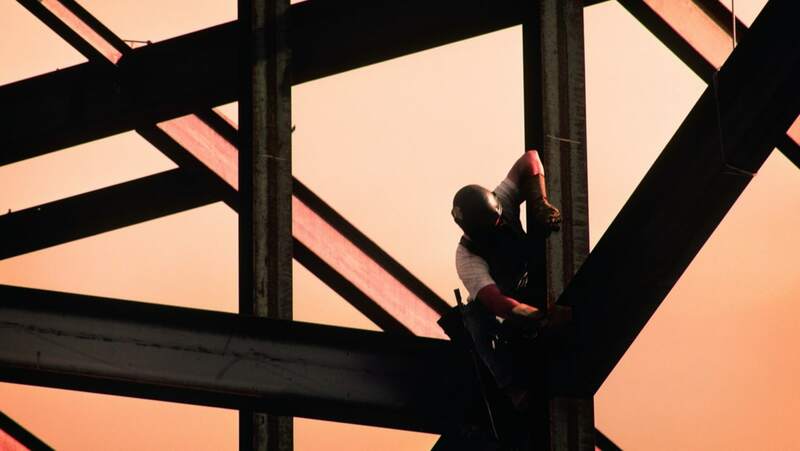 Working at height exposes workers to a variety of hazards that are more likely to seriously injure or kill workers than many other kinds of work and these injuries are disproportionately fatal. By taking simple precautions and choosing the most appropriate forms of protection workers can greatly improve their safety while working at height.